I cannot believe how long it has been since my last post. It’s true what they say when you leave things for a period of time that it becomes harder to go to back to it, I kept meaning to do some blogging but it always got put to the back of the daily jobs and I never reached that far down the list lol. Unfortunately all the social networking got put on hold for various reasons but I do enjoy this side of the business to interact with customers or just people who have a common interest in jewellery and I have set myself some new goals for the foreseeable future. I do have a few topics and some new jewellery to share so I will be doing a fair amount of blogging over the next few days but thought I would change how I write the blog and make it more open about us , our jewellery and life in general. As much as I love to share our jewellery adventure with you guys I would like you to get to know us because we would like to a more open and engage more with you rather than being boring with continual work blogs although that is very important because I love to talk about jewellery but all work and no play makes jack a dull boy so I want to share lots of new topics and some personal stuff about us and somethings that get my blood boiling like talentless “Jewellers” who copy other Jewellers designs to get ahead! 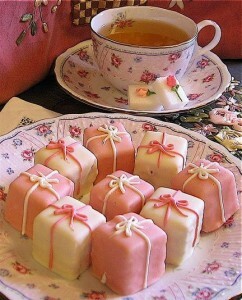 Right, Off for tea and cakes now. Just wish this was what I was going to get but mine looks like it has been dragged through a hedge backwards. I cannot believe our last post was on March 11th, We have had a few problems with the new website and all the technical things that go with it, as in fixing one problem and another one turns up but that’s all in the past know (I hope). As well as all this going on me,my wife and my nearly 2 year old son have all been ill and basically all the work piled up with the admin side of it as well as making orders and new designs. We did get back on track a month ago but we were then getting ready for our holiday so again no time to blog. We have just got back from three great weeks in Brittany where we have recharged our batteries and are ready to get back on track so lets talk about jewellery and what has been happening since we last blogged. 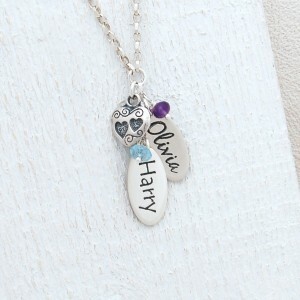 We have decided to change our most popular piece at the moment which is the personalised necklace and have made it look even better as you can see in the photo. To begin with we have changed the heart and added this beautiful one which makes the design come together alot more. We also changed the birthstones from swarovski crystals to AAA gemstones and decided to give the oval name tags a high polish look to them and then finally we have changed the chain to a slightly thicker one so overall its had a complete makeover which we are very pleased with as its not easy to change a good product and to make it better. This new design will be ready for sale in the next day or two just need to get some good photo’s . I have lots of new ideas and lots of old ones that i need to have a look at and i know Sue has a few of her own so hopefully we will be sharing alot more with you starting later today. I feel like this is my first blog after so long away but i feel i have accomplished a good deed and now feel better for it as everybody knows the longer you leave things the harder it becomes to get going again even if it is so late in the night. That’s me for now so bonne nuit.